Last year they had “Candy Bars” where you could fill a bag with all sorts of great candy. I brought one home for my daughter who now dreams of going to a Google party. The Google Dance has been going on for several years as part of the SES Conference series. 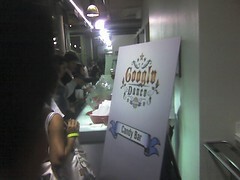 Held at the Googleplex the party features a huge buffet, food, wine, and beer stations all over the Google commons. For those who can’t separate work from leisure (which would be most tech folks), there are demonstrations of new technologies from Google and a “meet the engineers” face to face talk that is always very enjoyable. This entry was posted in computers, conference, San Jose, SEO, SES and tagged Google, google dance, mountain view, San Jose, SES. Bookmark the permalink.